Now let’s look at who I am. I’m always conscious of the state of cleanliness and clutter in my house, with the aim for improving it. It will never be magazine-perfect, at least partially because hubby and I are quirky enough our tastes probably wouldn’t fit a magazine! Little by little and gaining ground faster all the time I’m getting my household, both physically and digitally, organized. I do at least try to cook at home often, though I rely on my husband to sometimes tell me what to make for dinner (I’m happy to make it, just tell me what you want so I don’t have to think). I’ve only been late on a bill once that I can remember in 6 years of marriage (and it was a total mistake on my part of misreading the calendar) and I usually manage to get a decent amount of spoiling my loved ones in despite not having a huge budget. Hey, I love spoiling way too much to not do it! This definitely includes spoiling the hubby when I can. I do manage to fit in some time for reading, even if not as much as I’d like. I’m working hard on figuring out the best routine for me when it comes to writing around the schedules of a busy life. I do manage blogging at least sometimes… you’re reading a post now! And submitting my work is becoming a habit rather than something I have to remind myself about, which is great. I’m learning that I will never be consistent with other creative hobbies, but that sometimes I need to throw myself into them for a weekend or a week or two to get it out of my system in a rush. As long as I make time for it at some point, I’m happy. I will never be proficient at a musical instrument and that’s okay. I’m not getting rid of the ones I own, and perhaps someday I’ll figure out how to find time for them again. Television will always be there. I make time for the things my husband and I like to watch together (wooo Jeopardy!) because it isn’t just about TV, it’s about us time. I fit in the other things I’d like to watch here and there. And networking? A big work in progress. And that’s okay. Does anyone really know how to network anyway? Isn’t it just a bunch of people pretending they have a plan when really they’re all winging it too? Reading that it’s no wonder that I’m a huge cause of my own stress. I think I should be able to manage the work of five or more people. But I’m just one. And confession? I love sleep. Being aware of what you want to change is half the fight! Look at the dichotomy of who you think you should be and who you really are (at least for now). Where does your stress lie? I’m sorry things are stressful for you…. Somehow, I have these 4 long months before September (starting back in April) to not do anything. I’m unemployed by default (and legally unable to work)…. so I thought I would be bored out of my mind. Instead I created all of these new projects for myself to do and am feeling behind schedule daily. 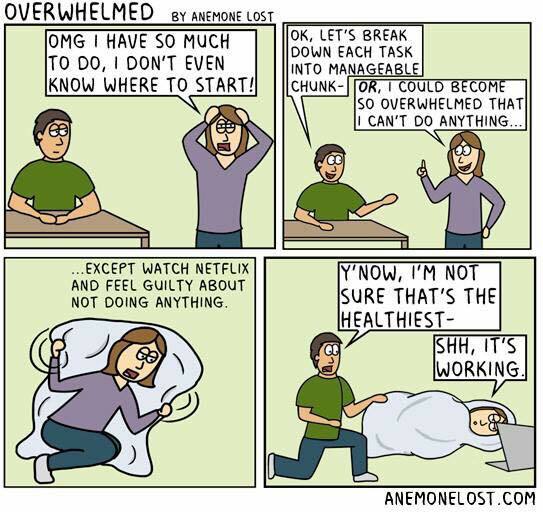 On the one hand, I’m doing stuff that I would never have time to do otherwise (like go jogging and diet) but on the other… I have to start wondering if I’m trying to keep myself busy so I don’t have to spend too long thinking very deeply about the source of this stress. Probably something I should just slow down enough to face and reckon with. At the moment the stress isn’t too bad! Haven’t been back home long enough for it to really set in yet I figure. But I also figured it was time to sit down and think things over a bit so maybe I don’t get quite as bad as I usually work myself up to being. Experience tells me it is best to break out your mage wand and greatsword and battle the source while you can still see it before it becomes buried in all the Other of life if you can. I believe in you! I can relate to a lot of this! I always am taking on so many side projects/hobbies etc as I am still looking for my path in life and am not happy in the job I have. I always keep telling myself you should be doing this and you should be doing that….should should should everywhere! I have been trying to choose only a couple of projects to focus on at a time and sometimes that works (but sometimes not). As always it is a work in progress! Thank you for sharing! “Should should should everywhere” is right! I hope you can find a way to slow down and still be happy with your progress. I’m right there with you! My husband actually stumbled across this comic a few days ago. When I sat down to write this post I knew I had to share it. Lists are absolutely my friend! But also sometimes my enemy… because I can get so caught up in list-making I forget to do the things on the list. Oops! Thanks for dropping by! I hear you on nature. Our house sits on a bit over 2 acres and it’s lovely. Hardly a farm, but just enough space to be able to step outside my door and have some peace with the trees and critters. I’m glad you found an outlet! I know lots of people who like various handicrafts that help them slow down and take an easier pace of things.